For all you political candidates who are promising to make sure the government does benefit-cost analysis for new regulations, congratulations! you've already made good on a campaign promise! When the U.S. Department of Transportation considered requiring truckers and bus drivers to log their hours electronically rather than on paper, it conducted a cost-benefit analysis to help decide whether the regulation would be worthwhile. The rule was intended to reduce the number of crashes related to driver fatigue by improving compliance with limits on the number of consecutive hours the drivers spent behind the wheel. The existing paper system was virtually impossible to verify, according to the Federal Motor Carrier Safety Administration, and a new automated system would improve roadside enforcement of safety laws. In this case, the DOT valued a statistical life at $9.2 million and estimated the regulation would save 26 lives annually. In addition, it was predicted to prevent 562 injuries. The total value of the safety benefits, the agency calculated, would come to $572 million. An additional $2.4 billion would be saved in paperwork, the agency estimated, with the value of all benefits topping $3 billion. On the other hand, the agency estimated the annual cost of implementing the regulation would be about $1.8 billion annually, including the costs of the equipment, training and enforcement. Concluding that the net benefit would exceed $1 billion, the agency implemented regulation in December. Commercial truck and bus drivers who currently use paper log books to record their hours of service have two years to comply. Read more about the value of a statistical life in The Numbers. Follow that last link from some input from Viscusi, Cameron and Banzhaf. [The VSL] remains so touchy that last month the EPA said it intends to change the name to something less provocative the next time it adjusts its estimate. While new nomenclature has not yet been selected, two possible alternatives are “value of mortality risk” (VMR) and “value of risk reductions” (VRR) for mortality. The second of these was suggested by the SAB-EEAC (USEPA 2011) and has been used in at least two published studies since that time (Scotton and Taylor 2010, Hensher et al. 2011). The specific choice of measurement units is arbitrary; as long as consistent units are used in an analysis the results will be valid. Nevertheless, the use of standardized default units could have the practical advantage of promoting some degree of consistency among reported summary statistics describing the results of regulatory impact analyses. For example, default measurement units for reporting estimates of the VMR or VRR for mortality could be $/micro-risk/yr, where a micro-risk is defined as a risk of 1 in 1 million. In this case, a VSL estimate of $10 million per statistical life per year would be equivalent to a VMR or mortality VRR estimate of $10 per micro-risk per year. I vote for VMR (while VRR gets lives out of there, it could cause confusion is users wonder if it also applies to other risks). And why am I breaking this story? Isn't Tim on the EEAC (and that means he has a vote!)? MRE Awards "Publication of Enduring Significance"
Marine Resource Economics (MRE) is proud to announce the inaugural winners of the journal’s Publication of Enduring Significance Award: James L. Anderson, awarded for his 1985 article “Market Interactions between Aquaculture and the Common-Property Commercial Fishery,” and Daniel S. Holland and Richard J. Brazee, awarded for their 1996 article “Marine Reserves for Fisheries Management.” The articles will be available to read for free until June 30, 2016. 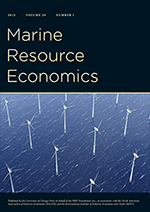 The new Publication of Enduring Significance Award recognizes articles published in Marine Resource Economics that are important for contemporary researchers and other literature that is built on them, or that remain relevant for current policy issues. Two articles were selected to receive the first award; both articles were ahead of their time and continue to be relevant to current policy issues. “Market Interactions between Aquaculture and the Common-Property Commercial Fishery,” by James L. Anderson and published in Marine Resource Economics, Volume 2, Issue 1 (1985), won for establishing conceptual links between farm-raised fish and capture fisheries, deriving the implications of growth in aquaculture for wild fish stocks using an elegant bioeconomic model and anticipating the importance of the aquaculture industry for global seafood markets. “Marine Reserves for Fisheries Management,” by Daniel S. Holland and Richard J. Brazee and published in Marine Resource Economics, Volume 11, Issue 3 (1996), won for launching the economics literature on marine reserves for fisheries management, accurately situating marine reserves as a second-best policy, clearly framing the inter-temporal tradeoffs involved in forming marine reserves, and anticipating most of the issues that subsequent literature explored in greater detail. Award-winners are selected from the archive of articles published at least eight years ago in any of the journal’s three sections: “Articles,” “Perspectives,” and “Thalassorama.” When a winner is selected, the award is announced every other year in the journal’s second (April) issue. For additional information, or to download the articles, visit here: http://www.journals.uchicago.edu/journals/mre/pesa or follow the links under the titles of the articles above. Congratulations to Jim, Dan and Richard for this recognition of their significant contributions! This is how to celebrate the life of a friend. *For the record, I'm not planning to go anywhere anytime soon.